We slept in this morning and didn’t leave until 7:15am to let it warm up a bit because we knew we would be crossing the Gila River a lot today. It was 34 degrees when we woke up and us girls were having flashbacks to our river crossings in snow and below freezing temps during the PCT in 2011. We were cold, but knew it could be much worse and that it would warm up as the day progressed. The most difficult part in the morning is when I’m packing up my pack knowing I need to pack as if I’m going to fall in the river. We all have large trash compactor bags that we use to line the inside of our packs when there is a chance of rain or stream crossings. Anything we want to stay dry needs to be in that trash compactor bag just in case the pack ends up in the river. The difficult part is when it’s that cold in the morning and all I can wear is shorts, my long sleeved shirt, and my thin rain jacket. My pant legs are put away since I’ll be crossing streams and I can’t wear my down jacket because it is safe and dry deep in my pack. Brrr! 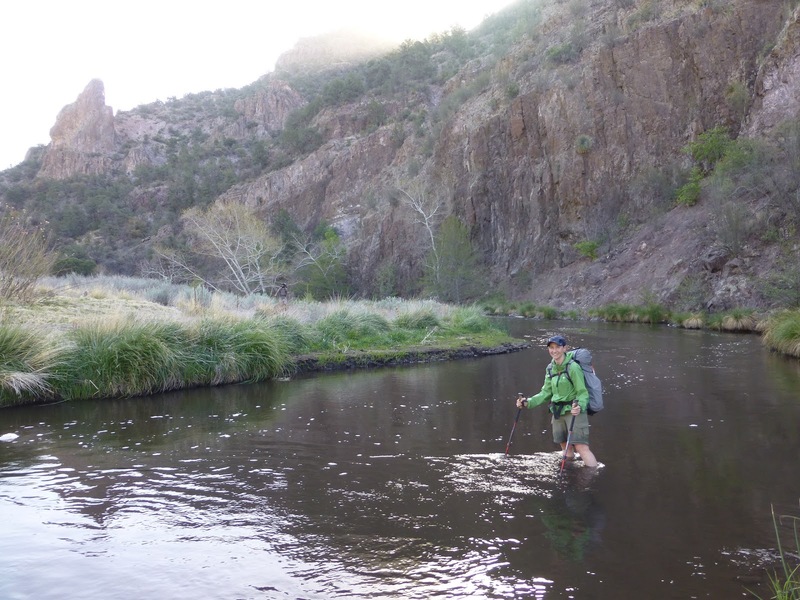 So we got going by 7:15am and crossed the Gila River within 20mins of starting. We were pleasantly surprised that it was very mild compared to the snow melt and that feeling of shards of glass in the ice cold Sierra snow from the PCT. 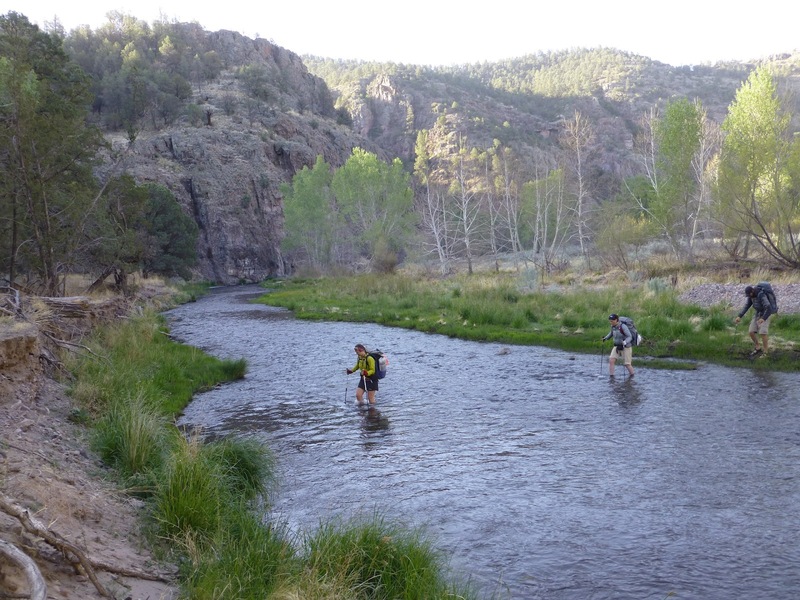 The Gila River is especially low this year, so the crossings were not dangerous. The current was not strong on most of the crossings and varied from ankle deep to upper thigh on me. Temps warmed up to the low 80s I’d guess as the day went on and the crossings were refreshing. 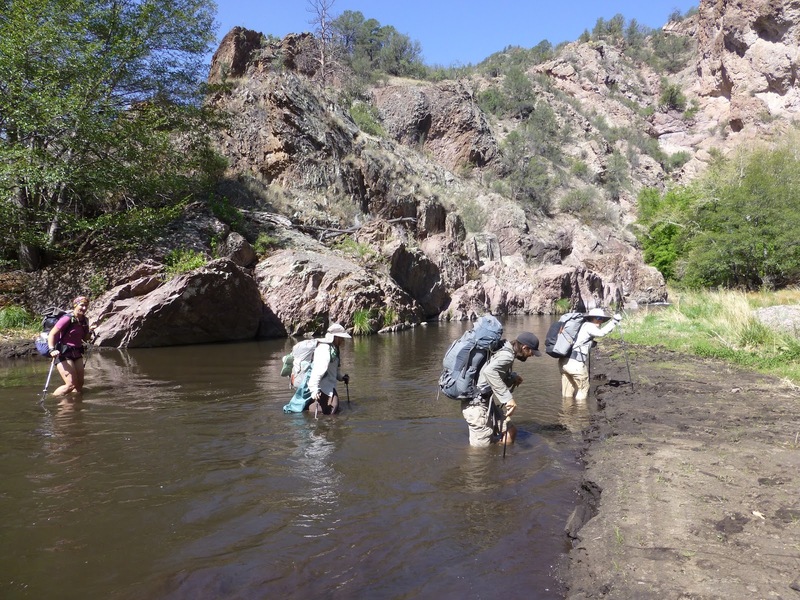 We crossed the Gila about 38 times today! It was a fun day! Hard to believe we were just in the desert not that long ago. While we walked, Liz was identifying all the plants for me and quizzing me on what they are called. 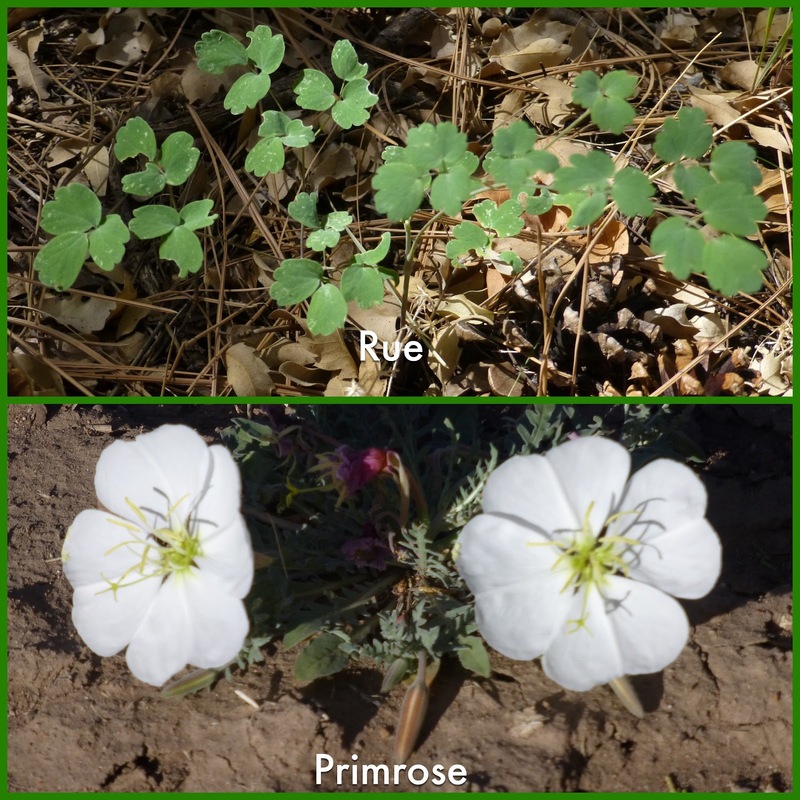 I was most excited to find out that two of the plants we’ve been seeing in the Gila are rue and primrose….two of the names from the Hunger Games series! Of course, I had to get pictures. Love it! 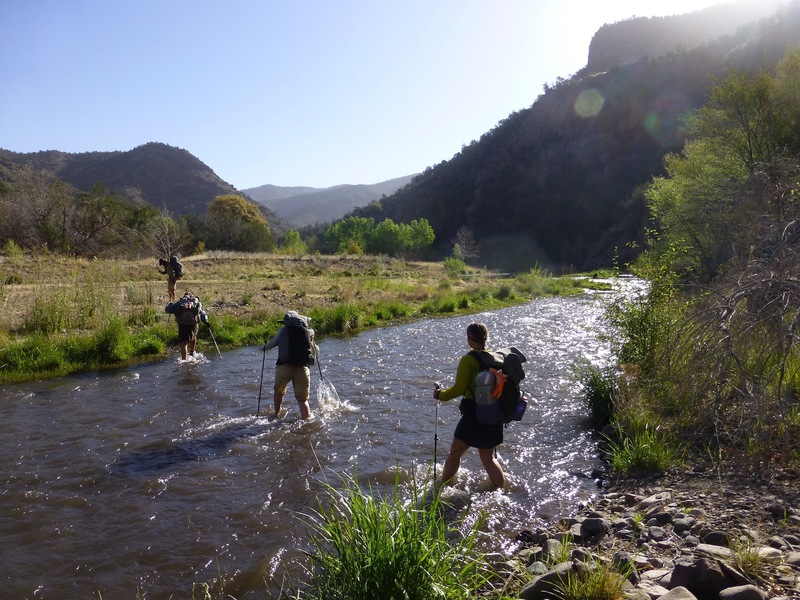 We still have 85 more crossings ahead and we heard it just gets more beautiful, so we are looking forward to more time in the Gila. The goal of the day was to make it to Doc Campbell’s. A small convenience store where we could get our resupplies for the next leg and also camp where there are formal hot springs. Their summer hours have yet to start, so they closed an hour earlier than our guidebook says and we luckily made it 20mins before they closed. Other hikers were there when we arrived. Puck was on his way out, but Sweetfish, Peru, and Radar are still here and also setting off tomorrow. Here’s everyone getting their boxes at Doc’s. 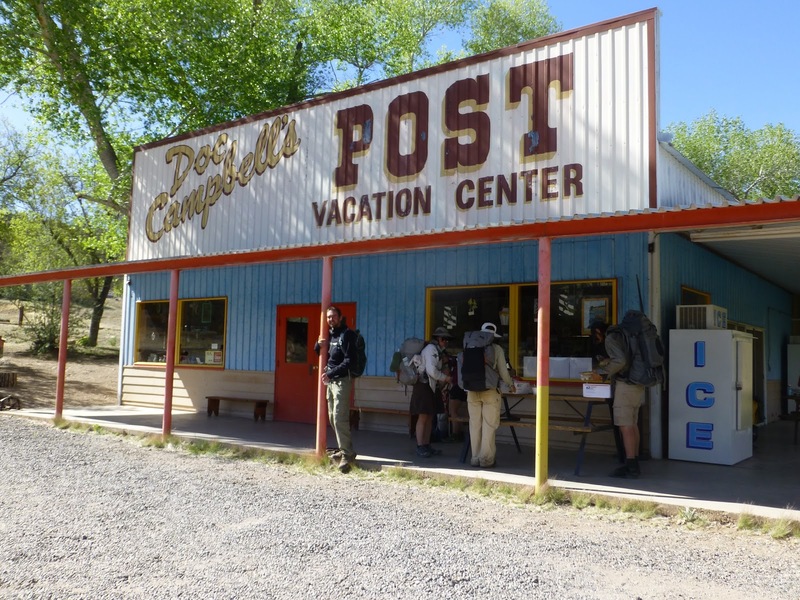 The campground has showers, a full outdoor kitchen, and natural hot springs with man made hot springs to soak in. It has so much more than I expected! I also want to comment about the community amongst the hikers on the CDT. It’s a bit of and older crowd (mostly 30s and older) and most hikers have completed at least one other long thru hike. There is an immediate commraderie and mutual understanding. Everyone is independent and responsible, while also contributing to the well being of the whole community. Just one minute after meeting Sweetfish today, he offered to include us in his spaghetti dinner. I took a moment tonight to watch perfect strangers work together to make dinner in the outdoor kitchen, do laundry, and share a common space. Everyone contributed something and there was a flow and communication. Everyone wanted to assist in some way and contribute to the process. It was teamwork you’d be fortunate to find among coworkers who have been together for years. We are all very grateful to be welcomed to such a great place and we want to treat this place with care and respect so that future CDT hikers will also be welcomed.